The thing about measles in particular is that, having gotten the measles back in the mid-20th century, my husband and I have a hard time thinking of it as a "dread disease." In those days, polio really was dreaded. Yes, that's a whole other dimension with the measles story. On a grander time scale, measles incidence flat lines effectively at 0% once the vaccine coverage really hit critical mass in the 2nd half of the 20th century, except for an uptick in the late 1980s. As you allude to in the 1950s-60s era with respect to measles vs other diseases of the time, even today, we have a heck of a lot more to worry about at the present time in the US than measles at every single age cohort on the mortality curve. It probably depended on how hard it hit you. Stu got it so bad he was hospitalized, iirc. Of course, he got the measles after there was a polio vaccine, but before the measles vaccine. I got mumps and chicken pox. Was vaccinated for polio, small pox, measles & German measles. Also vaccinated for whooping cough, but it wore off, and I caught whooping cough when I lived in NYC. Most people survive all of those. (Well, maybe not small pox.) They are still nasty, and can have serious consequences. White women in the U.S. have historically enjoyed low mortality rates. But in recent years, the death rate for adult white women 15 to 54 years old has increased even as the rates for black and Hispanic women have declined, according to a new analysis from the Urban Institute. Here's a closer look at the death rate for white women from 1999 to 2013, drawn by Urban Institute researchers from the Centers for Disease Control and Prevention's vital-statistics database. Is this age-adjusted? Could this just be an effect of white women "aging"? Part of the jump in the death rate for whites is explained by the epidemic of prescription painkiller abuse and overdoses that disproportionately affected whites. But that accounts for only half the total increase, according to the report. Other causes of death on the rise include suicide and respiratory disease. Some declined, including traffic deaths, homicides, and the cancers most closely linked to smoking. Though overdose deaths among blacks also increased, the rise was smaller. And overall mortality for black women fell dramatically, with declines in deaths from cardiovascular disease, infectious disease, and cancers, among other causes. Each of these broad racial and ethnic categories is a big group, with different social and geographic circumstances. So the analysis doesn't mean "that death rates are rising for all white women, everywhere in the U.S.," notes the Urban Institute, a Washington, DC, think tank. Other research has shown that longevity is decreasing for poorer and less-educated white women. We don't have enough evidence to tell whether the increase is a temporary one linked to painkiller abuse or if it's a long-term shift. The authors cite examples of other short-term spikes in mortality. Deaths increased for black women in the U.S. during the crack epidemic. For Russian men, death rates linked to alcoholism are still high but appear to be declining. According to a recent audit, there are 6.5 million active SSNs for people age 112 or older. Are we ending the mortality table too early? That is an interesting article on SSN and the potential for fraud. I'm curious though - the SS actuaries know how to adjust this for their mortality studies - they cross check against Medicare, and if there were no claims for the prior year or three, that is a pretty good indicator that the person is deceased. This seems like a good idea for the claims payers to adopt as well! 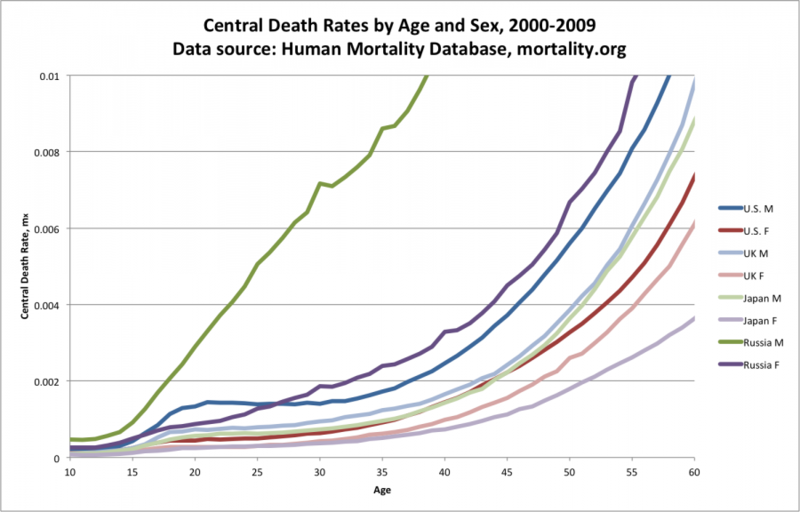 We then standardized the death rates for 2011 to the 2000 population of women ages 15 to 54. The age distribution of women in this age range had shifted to older ages in 2011, which could have caused an artificial finding of higher death rates. Wow. The whole paper is potentially a crock. The lead is on the faculty at Johns Hopkins. Two of the authors are apparently demographers. That they admit their findings may be spurious, but don't do the research to readily accept or reject their main findings, is very unprofessional to say the least. Last edited by Guilty Bystander; 03-10-2015 at 02:07 PM.. Isn't there a SS master death file? Seems almost inconceivable that someone wouldn't cross check that with active SSNs. Of course, any kind of smell test would tell you 6.5 million people over age 112 aren't going to be alive. I'm guessing no one even looked at the numbers. I love these longitudinal studies.